To recap, in July 2014, a California court entered a restraining order against David Piercy, including ordering him to remove the protected parties’ personal information from the internet that he had posted, and to not contact the protected parties directly or indirectly. After the court entered its order, the same material posted by David Piercy that the court ordered removed, was posted on Vicki Pate’s blog. Vicki also posted the material on Scribd. In November 2014, Vicki Pate posted documents on her blog and Scribd account about Santiago, using documents that Piercy purchased from a court. Vicki accused Santiago for the taking down of the material she posted. All of the aforementioned hosting companies understood the court’s order and complied. Santiago did not need to convince them — they have their own legal departments. Update: I was recently informed by Vicki Pate that what Santiago told me is not true. Vicki stated that she voluntarily took down those pages because they included allegations that “Xena” is “Barbara J. Wells”. Vicki said she had no proof to support that allegation. New accounts on Twitter popped up, and some of the same material, with Piercy’s original “convicted woman beater” allegations were circulated on Twitter. The “convicted woman beater” is a matter of semantics. Santiago’s ex-wife was granted an Order of Protection against him. In their divorce, the court ordered a continuing restraining order against Santiago. However, it was not a criminal case that required a conviction or acquittal. Santiago acontinued to say that the case had been dismissed. That is a partial truth. The Rule to Show Cause that Santiago violated the restraining order was dismissed, but not the restraining order itself. Because of the “convicted woman beater” accusations, Santiago called the police and complained that Piercy violated the civil harassment restraining order. Two law enforcement jurisdictions did not make an arrest. In January 2015, Santiago filed to have Piercy held in contempt for violating the restraining order. Santiago announced his actions of filing the contempt petition on Facebook. Then, a man rode into town. He was a stranger. He went after Santiago without mercy. Santiago did not know a man who I will refer to as “GL” and at first, he thought that maybe Piercy opened a Twitter account in that name. Upon a closer look however, GL had that Twitter account for years, but did not have recent tweets. The same was later discovered with a free Word Press blog – GL had one that he had not posted to in years. The content of GL’s older stuff was not demeaning, included no doxing, and was neither filled with vile name-calling. On February 1, 2015, GL sent a tweet to Vicki and Piercy acknowledging that he received documents from Piercy that pertained to Santiago. GL launched a website for the specific purpose of dedicating the content to Santiago’s life. The domain name to the website was Santiago’s name. GL posted the personal information of Santiago and his minor daughters, Santiago’s wife and her employer, including their contact information. Microsoft took down that site, but restored it on what we understand to be GL’s contention that he was not a party to the restraining order. Santiago spoke with his legal counsel who believed that the domain name, considering the content of the website, constituted identity theft. Santiago contacted law enforcement. On February 10, 2015, GL let Piercy know that he was updating the website on Santiago. On a free Word Press blog, GL posted the same personal information. Word Press suspended that blog temporarily until GL removed the minor’s personal information. The first hearing on the petition for contempt was scheduled for February 26, 2015. On a privately hosted website located in China, and in which Vicki is associated, the same material that GL was posting was posted there, along with a threat that Santiago should “back off” or he had a surprise coming. Then someone tweeted the link to the college where Santiago’s wife is employed. I saw a storm brewing. One handle that was alleged by Vicki and Nettles to be used by Santiago is a variation of a handle that Santiago once used. It is not Santiago but another victim of Piercy’s harassment. Piercy is familiar with that person because he photoshopped photos of her deceased mom, made videos about her using her Facebook photo distorting it, and told her to kill herself. Piercy has also told me to kill myself, but I’m not a person who had recently lost her mom and then saw Piercy distort my deceased mom’s photo to mock and demean her. I will publicly state that handle because Twitter has suspended that account. TrayvonWarrior10 was maybe the 5th Twitter account that person opened in effort to have me approve her to follow me on Twitter. The first time after I blocked her, she adopted another handle and asked to follow me. I knew who she was but thought that I would give her another chance. I ended up having to block her again, and declined her next requests to follow me at least 4 times when she used different handles, finally approving her under her handle TrayvonWarrior10 to give her another chance. I won’t go into details, but I blocked her again shortly thereafter. Like Vicki, Annette alleged that people tried to get her fired from her job. Annette however, believed that some of the handles weren’t Santiago, but a person known as Danny Warrior that she had personal information about to jump-start GL to dox Danny Warrior. On the belief that Annette Kelly was being harassed by Danny Warrior, GL took action to dox for their personal information. Each time that Annette felt that she was being harassed, she alleged it was Danny Warrior using another handle. Anyone who tweeted to the handle alleged to being used by Danny Warrior was suspect of taking part in harassment. Things got so bad that Annette told GL that he was doxing the wrong people. On the morning of February 26, 2015, which was the day of the first hearing on Santiago’s petition to have Piercy held in contempt of court, GL warned Santiago that his minor daughters and their future spouses would be a part of “this too.” He named Santiago’s minor daughters in another tweet, and said that he would blog about them and any further relationships they might have. I’m not putting the screenshots of those tweets here because subsequently after the February 26, 2015 hearing, GL deleted them and removed all of the material that he posted about Santiago and his family, and took down the website that he specifically opened to post Santiago’s personal information and that of Santiago’s family. GL apologized to Santiago, and for that we publicly recognize. We also publicly recognize that the website hosted in China voluntarily removed the material they posted about Santiago. 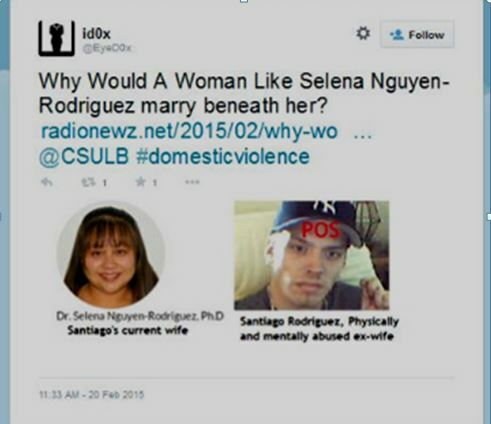 As time continued, more was exposed about Santiago’s behavior. GL provided me with information that shows that Santiago was emailing him with warnings about others and bad mouthing them. At the same time, Santiago was communicating with the same people warning them about and bad mouthing GL. This entry was posted in cyberharasment, Internet extortionists and tagged Annette Kelly, cyberharassment, Danny Warrior, flightattendentfailures, restraining order, Santiago Rodriguez, Selena Nguyen-Rodriguez, TrayvonWarrior10. Bookmark the permalink. Santiago, I advised against posting that but since you insisted, I’m going to leave it. You do realize that a dismissal of a Rule to Show Cause means that there has to be a restraining order in place before it can be alleged that it’s been disobeyed, right? So Vicki Pate represented that Denise is guilty of stalking and domestic violence when the docket shows that the stalking case was dismissed? I remember when Vicki posted a docket sheet for a case of sexual assault, for a “Trent Sawyer” in Florida. The Trent Sawyer she intended to dox resides in Tennessee. The docket sheet shows that the case was dismissed, but till this day she, Annette and Piercy claim that the Trent Sawyer they want to defame is a sexual offender. Annette claims that she never watched Trent’s videos, but also says that she can’t stand his voice. She would not have heard his voice unless she watched his videos. What they do is an effort to intimidate and redefine their target victims. Then they use that in effort to have them leave the internet. Funny, that of the people who do leave the internet because of them, when someone else appears who they don’t like, they allege that person is the person they ran away. Thanks for your comment, Denise. I observed Vicki on Twitter defending herself at your expense. In doing so, she uses race as a basis but as I understand it, your lawsuit against her has nothing to do with race. Rather, it’s because of her defaming you. She can let the court decide. All she has to do is accept service of summons and the complaint, rather than going from state to state camping out with others. I just want to wish you good luck. I know it can be frustrating when someone is evading service. Hang in there, keep focused, in time things will be set in motion. What has been done to you isn’t much different as to what’s been done to me. The only difference is you were not even on Social Media when this came up. They targeted you and brought you into this just so they could get a few hits on their blog. Stay strong in the end I’m confident it will all work out for you and keep in mind sometimes it gets worse before it gets better. But in the end no doubt it will get better. I mean put it to you like this, you don’t evade service, or duck and dodge like that if you’re not guilty of something. Very enlightening comments by all of you on this page. I only have to wonder why the heck they act like they do. I can’t see how behaving like this benefits anyone. They are miserable people with miserable lives. As someone who participates regularly on Blackbutterfly7 has said, “Hurting people hurt others.” As psychologists say about kids who grow up to be child abusers, they learn what controls them and use the same means as adults to control others. Then we can add envy, ignorance, and disappointment of their own lives with it, and the results are as you say — “miserable.” They do not see that they need help because they take pleasure in the thought of hurting others. In their minds, they believe that their targeted victims deserve it. You hit the nail on the head. In fact I was watching Ray Donavon last week. It’ss a TV series on Showtime, good one to. Micky Donavon, father of Ray was asked by his grandson while they were visiting his uncle in jail if his uncle was a bad person. I mean he is in jail right? But the final group is the smaller of the bunch, real criminals as he referred to it people who find joy in hurting others. Truth is the most dangerous criminal out there is the one who hasn’t been caught yet. You wanna know why? Because he has gotten away with it. He is empowered to continue each time he gets away with it. I know of one; murder, arson and larceny. He’s been doing it since the 80’s in various states, and various law enforcement jurisdictions within states. He knows they don’t coordinate. It was not Santiago who thinks that you committed ID theft. His attorney said that because you opened a website using Santiago’s name as the domain name, and because the content of that website pertained to him, his personal life, and his marriage, that it might constitute identity theft. You acknowledged that you were mentioned on this blog for context. I understand that Santiago has buried the hatchet with you and highly advise that you not do anything to undo that. Just a note for something else you might not know, (since you mentioned credit reports). David Piercy did unlawfully, and without authority, access Santiago’s credit report. Piercy posted a screenshot from his computer on his Twitter account, and the tab showed Santiago’s name with the name of the credit reporting agency. Piercy probably had not noticed that he still had that up on his browser when he took the screenshot intended to show something else. Shortly thereafter, Santiago received letters and text messages to his cell phone saying that his credit had been approved. In other words, someone was applying for credit in his name. When Santiago revealed that on Twitter, (and if I remember correctly), it was Piercy who mockingly said that Santiago had no credit — it is all in his wife’s name. Accessing someone’s credit report without authority is a serious matter. It is true that mean people are suffering. It’s also true that the above group of suffering people are truly busy stirring shizzazz and probably deserve any karmic blowback they receive. They could have stopped. They have been given various signs that stopping would be to their benefit. They are addicted to crimes, addicted to hurting others. this is really disturbing. i struggle with my racism–i really do, and i hate it–but this helps me . . . stay rational and caring. Hi Kevin. There’s racial prejudice, and then there’s racial bigotry. Prejudice is generally not knowing and going by what we are told or assume. Bigotry includes prejudice but also combines hatred. Prejudice is overcome by knowledge and experience. The only answer I have for bigotry is to realize that all humans are subject to the same things; hunger, sleep; illness, taxes and death. I really had no idea how bad the DP/VP issue has been for the Santiago’s. I do hope things get much better for them! I do also see what lirette is capable of, and the pattern of his behaviour. It’s not only Santiago. Piercy has done some horrible things to others and Pate follows up by demeaning and defaming them on her blog. Last year, he acquired a program that, when twitter handles are entered, they track to the general geographical location for the person. The user can then go deeper and have the program trace email addresses used by the person. He did that to towerflower, another person who writes for Blackbutterfly7. Towerflower has publicly shared some things about herself, such as being a certified gun instructor and her line of work. At the same time, @puffytuffy misrepresented something that towerflower wrote for the blog. @puffytuffy posts to blogs as 2dogsonly. Of course, they doxed puffytuffy and it was only after she started attacking us that they stopped posting her personal info on Twitter. Can we say “blackmail”? I don’t understand it either. It goes back to 2012 and the impression I got is that they thought they had personal responsibility to shut the mouths of those who they disagree with. I’ve previously written that there are people who disagree but they mind their own business on the social media where they are active, and support whatever their ideologies are without disparaging and defaming others on social media. Disagreeing about an issue or subject should not progress into doxing and defamation, but that is mostly what Pate, Piercy, and Annette do. They all have blogs, but they do not write in support for their positions. Their blog following never took off, not even to double-digits. They get more attention on Twitter because they can engage people on that venue without people having to come to them. Of the 5 who I identified on this blog, only thehoff75 has come here and apologized.